Does Your Life Need Balance? The other day, I was out by the water here in Whatcom County and witnessed an interesting situation. Out on the channel there was a log with three seagulls perched on it. They were in perfect balance and enjoying the ride as they floated down the channel. I raised my camera to get a picture when all of a sudden, one decided to take off. What happened next was pretty funny but also an interesting life lesson. 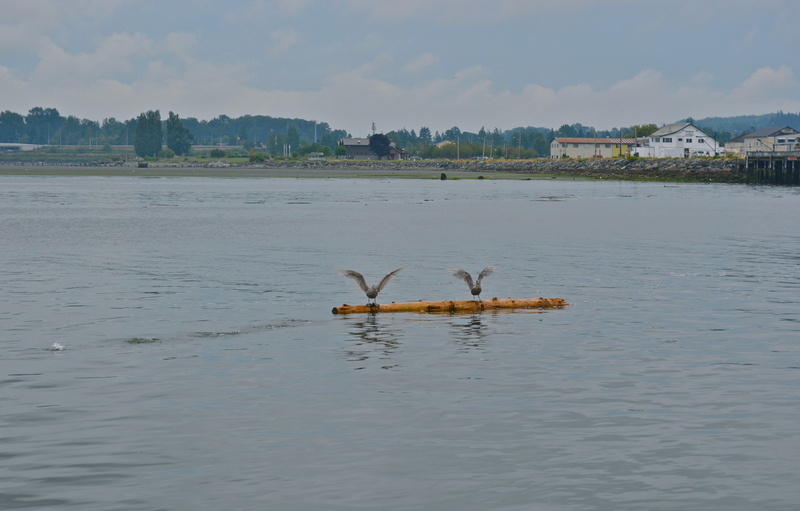 One of the seagulls decided to lift off and it left the other two struggling to maintain balance as the log shifted and moved. So I got the picture of the two seagulls who were left trying to work together to save themselves from having to leave the log. They raised their wings to maintain balance as they slowly moved up on the log. However, as they moved to correct themselves, the log also rotated, and so they were doing some pretty fancy foot work as they worked to stay on. Eventually, after each trying to right their position, it failed and they flew off. This whole scenario seemed like a great lesson in a balanced life for me. We hear so much about the importance of keeping balance in our lives. We have a lot going on, and if we don’t maintain balance, one area of our life can get out of control and take over. We all know the story, right? Let’s think about the seagulls for a minute. Before the “situation” happened, they were just floating along enjoying the free ride down the channel. Then, the one decides to take off. No warning, no discussing it, just doing what that seagull wanted to do. But what was left in the wake of the one seagull leaving were the other two picking up the pieces of that one seagull’s decision. The other two of them scrambled trying to stay on for the ride. It was so easy when they were all together and no one else is messing around. Our life gets like that. One person does something, or a situation comes up, that sends us spinning out of control. Our life balance is totally off and we are dangerously close to upending our log and hitting the water in a belly flop. Oh, we try to adjust our lives at times with things such as time management, charts, clean and organizing our house, quit one thing to free the schedule, but then start something else. We try for a while to have more family time or time for the Lord in an effort to right our log, but it doesn’t last much longer then the float down the channel did for the seagulls. We flap and flutter, trying to do it by ourselves. We do the dance to stay on, flap our arms trying to keep from losing it, and end up leaving the log or, in other words, running away from the truth of what is really going on or how we feel. So what is the answer? We need to have God on the log of life with us! I mean really. We trust Him with everything that is in us. Are we going to believe IN God or are you going to BELIEVE GOD? Just like He calmed the storm on water, He can calm the storms in our lives. If we partnered with Him to give us balance, we would have a different reaction when one decides to go off on some tangent of their own or life hits us full face. We still have God on our log to help us maintain balance. So we don’t have to do the happy feet to stay on, we can do the happy feet because God is there. He is reaching out to us to say, “keep your feet firm and stretch out those wings, catch the air and slowly move forward with me. I’m here.” You know what will happen? He will give you a picture like He gave me that day! If our hearts are open to Him, He will speak to us through the simple things in our lives. He wants to remind us of His presence and to help measure our steps and stay on the log of life with Him. Lift your wings and let God be the wind beneath them, trusting that with His help, you can float down the channel of life and enjoy the scenery of life as you go! He may even ask you to dive in with Him! OR maybe you are the one leaving the log of the status quo to be lifted higher with Him! God bless you as you invite Him onto your log to dangle your feet in the water together! Next postDo You Live With A Locked Door?